Posted on Friday, January 24th, 2014 at 5:06 pm. 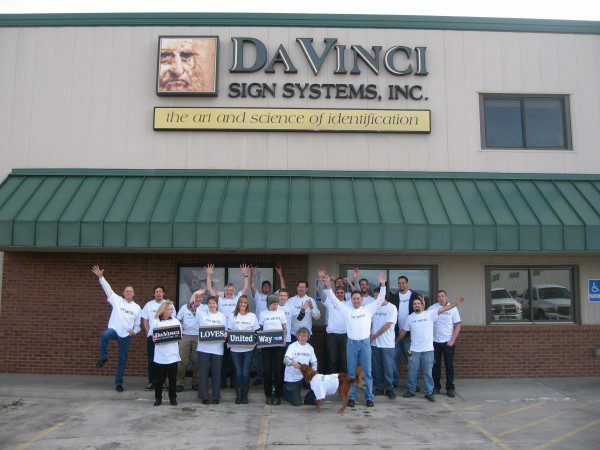 When the time came to plan for their 2014 United Way campaign, the employees at DaVinci Sign Systems found themselves without a coordinator and with a busy schedule that left them with little time or energy to put together a company presentation. They still wanted to have a relationship with United Way, however, after they enjoyed participating in their successful 2013 campaign and having the opportunity to LIVE UNITED through giving, advocating, and volunteering. After some words of inspiration from company president John Shaw and lots of support and hard work by new campaign coordinator Kathy Winter, the company was able to pull off a great campaign, nearly tripling employee participation and overall giving over 2013. DaVinci also plans to continue to provide in-kind donations to United Way, the most recent being a sandwich-board sign that will help increase foot traffic and provide greater visibility to the many United Way events planned throughout the year. The DaVinci Sign family is a proud participant in United Way and embodies the passion and culture of helping to build a better community!